Ultimate Uncapping holder for the fastest and easiest way to uncap medium and shallow frames. This unit sits on rim of 5 gallon bucket and cappings fall directly into bucket off of frame. Lightweight and easy clean up. Can be used with wooden or plastic frames. Perfect for the hobby beekeeper. 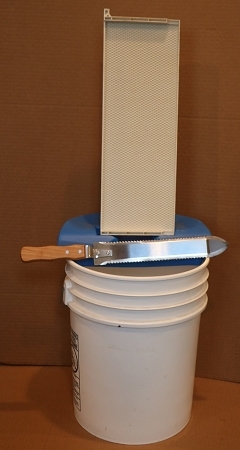 Includes a cappings slicer for uncapping honey. This makes uncapping ver easy. This is a MUSTHAVE!